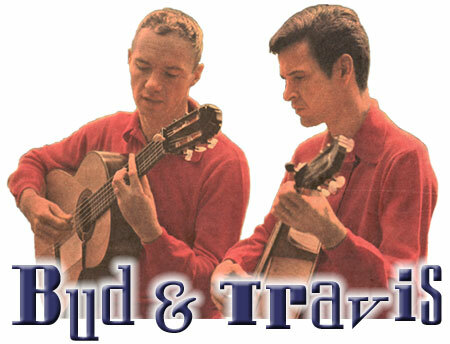 Welcome To The Bud & Travis Home Page! Hear B&T sing over a Phil Silver comedy sketch! "Lost" Bud and Travis concert from the Hollywood Bowl now available! WOW!! Set List: Gimme Some, South Coast, No Me Quieras Tanto, They Call The Wind Mariah, It Was A Very Good Year, How Long How Long Blues, Cielito Lindo Son Juasteco, Cloudy Summer Afternoon, Alma Llanera, Abilene, La Bamba. Go here to actually download the concert: http://newstalgia.crooksandliars.com/tags/bud-travis. There is an option to download a full-length MP3 of the concert, so be sure to do this download before the show goes away! The concert has been re-presented on www.travisedmonson.com for the past several weeks, but it is chopped up and presented a section at a time on different pages. To grab the entire MP3 file, go to Newstalgia. New Travis Poetry & Music! CD: Travis Edmonson Live In San Francisco. Poetry: Thoughts That Didn't Pass. Go here for more info; don't miss out! Want to attend future Travis tributes, or be kept informed about Travis-related events? Join Bonnie Brock's news list by e-mailing travis@arizonafolk.net. All Videos of TV Appearances Available Full-Length! Extremely Rare Bud Dashiell (and Kinsmen) Appearances from the Skip Weshner Show! Enough music to fill 2 CDs! Travis' "Border Crossings" in its Entirety! "Bud and Travis were the best. No one of their ilk could even touch them. When they got on stage and did their thing, there was nothing like it. Wonderful." The photo on this main page is courtesy of Travis Edmonson, Rosemarie Heidrick, and the Arizona Republic. The photo in the top left corner of every sub-page, along with the photo on the "Introduction" page, are all courtesy of Michael Ochs Archives, Venice, CA. This site is a labor of love for Thomas P. Straw of Pittsburgh, PA. When you're done visiting here, be sure to visit the new and improved Kingston Trio web site!